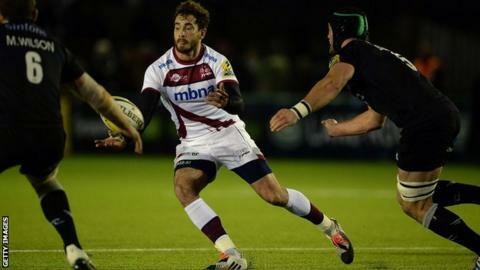 A moment of magic from England hopeful Danny Cipriani helped Sale Sharks record a third straight Premiership win at the expense of Newcastle Falcons. Cipriani's chip ahead and smart pass wide started the move that put Johnny Leota in for a match-winning try. Falcons had led through Juan Pablo Socino's solo score and Rory Clegg's eight points with the boot. Sale's other points came from Dan Braid's try, added to eight kicked by forgotten England fly-half Cipriani. Dean Richards' side had been starting to reap the rewards of their artificial surface at Kingston Park, with back-to-back home wins prior to this game. "I feel that the England coaches have been a little bit conservative," Diamond told BBC Radio Manchester. "They've not taken the risk of having Danny and I think it's their loss." However, they were unable to keep Steve Diamond's men out in a battle of the Premiership's northern outposts but picked up a losing bonus point. Falcons' 18th try of the season came when Argentine centre Socino dummied and danced through the slightest of gaps to score, and Clegg added the extras. With decent conditions, albeit cold, both sides hit the ruck and carried with intensity but errors - notably from the Falcons - made for a scrappy game. Errors in turn led to penalties, with Sale looking to turn the screw with kicks to the corner and a push for tries, rather than taking the points. Those choices yielded mixed results, as Braid went over after sustained pressure, but the option not to kick penalties eventually led to Sale going in 10-8 behind at the break. Clegg had clipped a penalty through the posts to extend Newcastle's lead, then full-back Mike Haley saw a score chalked off for Sale before Cipriani's place kick as half-time approached. The second period began with the same physicality but was not matched by points, with Clegg's effort from near halfway on 57 minutes the first addition to the tally. Cipriani, who was not in England head coach Stuart Lancaster's squad for this month's autumn internationals but is keen to win a recall with next year's World Cup approaching, found the target with a three-pointer of his own shortly after and then he single-handedly turned the score, and the game. He chipped ahead of the black-shirted Falcons ranks, slipped a Clegg tackle and fed a team-mate out wide who then moved the ball back inside for Leota to steam across the whitewash. That proved enough to settle the match and end Newcastle's home revival. Newcastle Falcons: Tait; Sinoti, Tiesi, Socino, Alesana Tuilagi; Clegg, Blair; Vickers, McGuigan, Tomaszczyk; Green, Barrow; Wilson, Saull, Hogg (capt). Replacements: Rogers, Fry, Wilson, Thompson, Furno, Fury, Powell, Hammersley. Sale Sharks: Haley; McLean, Leota, Tuitupou, Cueto; Cipriani, Cusiter; Lewis-Roberts, Jones, Cobilas; Mills, Ostrikov; Braid (capt), Lund, Beaumont. Replacements: Mamukashvili, De Marchi, Harrison, Easter, Fihaki, Cliff, Macleod, Jennings.